Waiting a few months for an escape room to open is nothing new for me, but the Crystal Maze is a bit different. In some sense, I’ve been waiting for this moment since I was a child watching Richard O’Brien (I never warmed to Tudor-Pole) playing the harmonica to the viewers, as contestant after contestant failed miserably to complete the simplest of games. Even if you only count their unbelievably successful crowdfunding campaign (just short of a million pounds), it’s been the best part of a year. Even waiting from the time I booked the ticket around three months ago was tough. But slowly, slowly, the day came round. I’d tried my hardest not to raise my expectations too much. We would only be spending an hour in the maze so, with seven team mates accompanying me, the most I could hope for was a couple of games, and I was very much aware that it probably wouldn’t be enough. I may have tried, but I failed miserably. As soon as I got on the train to head into London I was bouncing up and down with excitement. Everyone was excited – the sounds of our animated conversation bounced around our carriage and probably confused the hell out of the other passengers. The building itself gives absolutely no hint what lies within. Indeed, it doesn’t even say “the Crystal Maze” on the outside. There’s just a paper sign with the address printed on stuck to the inside of the door. Look carefully beyond, though, and you’ll see a bouncer and receptionist with branded jackets. One thing is for sure – you’re not going to get in here by accident: Before we even met our maze master (more later), we had to get past the bouncer, the receptionist, someone who helped us check in, a computer check-in and someone who explained the rules. Coats and belongings put away, we donned the traditional bomber jackets and got ready to make our childhood dreams a reality. For those of you who’ve never seen the game show, I’m not even going to try to explain. Go on to YouTube and come back when you’ve watched at least one full episode. Done that? Oh – if the person leading them round the maze didn’t have a bald head, go back and choose a different series. After a short intro video to set the mood, we were greeted by our maze master, the Mighty Moustache. Each team in the maze is accompanied by their own personal Richard O’Brien replacement. They don’t try to emulate O’Brien, which would be doomed to failure, but they capture the essence of the maze – strong personalities, some humour and plenty of energy. It’s clear both from personal experience and from reading TripAdvisor reviews that they’ve gone to a lot of trouble to recruit great hosts. If a good host is important in an escape room, they’re absolutely critical here. Keeping eight people (possibly strangers) engaged and enthusiastic for an hour when they’re mainly watching other people playing games is a tall order! He explained a bit more about how it would work, found out who our captain was (me!) and then took us off to the Futuristic zone. I decided to lead from the front and be the first into a room. As soon as I opened the door, I regretted that decision – it was obviously a tough room, and a potential automatic lock-in if I went wrong. I made a valiant effort, retrieving the crystal and making it half way back to the exit, but it wasn’t to be. Our first attempt ended not only in failure but in a lock-in. Those of you who remember the show will know that, to get someone out of a lock-in, you had to trade a crystal. Here, it’s a slightly more generous affair. You get set a challenge and, if you solve that, you win your freedom. If you lose, however, your team is forced to forfeit a crystal. That change in mechanic from the game-show is presumably to deal with teams that are made up of strangers (or, worse still, mainly friends and one stranger who gets locked in). Fortunately, with some help from a team mate (the rules seem to be fairly fluid! ), I got past the challenge and rejoined my team mates. While the challenge was well constructed, it was nowhere near as much fun as watching the other players, so it was disappointing when I realised afterwards that I’d missed out on seeing two games being played. Which brings me nicely on to my big concern about the whole thing – what would happen when you weren’t in a room? The answer was that you had a great time. Each game only lasted two to three minutes so, even in ones where you could be of little help (and let’s face it, we always *thought* we could be of help), you could spend half that time looking at the game and working out how to approach it. In most games your involvement was critical. I was particularly impressed at just how many of the games genuinely made use of several people. In fact, one or two games were probably more fun for the people outside than in! The games themselves varied hugely. Some (like mine, obviously) were nigh on impossible and will definitely have very low success rates. Some are virtually guaranteed success as long as you don’t panic. Most were very doable but a bit rushed at the end. As with escape rooms, the games masters are there to help you if you’re stuck, and my guess is that they provide significant help for teams that struggle early on. As an escape room devotee, I couldn’t help but notice that most of the puzzles would have fitted nicely within an escape room, with the exception of the Physical challenges (although I’ve seen at least one of them in an escape room). Disappointingly, there were some puzzles that were effectively mini escape rooms but really unimpressive ones. We played three such puzzles, and they managed to include a lot of my least favourite escape room tropes – including tedious UV searching, codes that were straight sums, colour-based puzzles and trying lots of keys until you found the right one. For me that was the weakest part, although I’m being hyper-critical, and for most players they’ll be thoroughly enjoyable. With all the zones done, it was off to the central dome to convert crystals to seconds and seconds to gold tokens. In order to make this as much of a spectacle as possible, they gathered all four teams together, introduced their games masters and announced how many crystals they’d gathered. The good news was that we were in the lead – 14 crystals, which would give us 70 seconds in the dome. In a change from the game show, there are no silver tokens, so all you have to do is catch as much as you can as quickly as possible. Which is no mean feat. The tokens were pretty small scraps of gold foil and ludicrously hard to grab. You’re not allowed to take them from the floor or walls, so it’s a massive challenge to get any at all. There are techniques which will help, but I’m not going to spoil the experience here – we worked them out afterwards, as we watched the other teams play. OK – I’ll give you one technique that works well: try to be the last team into the dome so that you can learn from others! Much to my amazement, we’d managed to convert our two-crystal lead into an overall victory. We didn’t get anywhere near the record, but our score of 139 put us comfortably ahead of the other three teams, who gathered 129, 129 and 119 respectively. It used to take them two days to film each episode of the Crystal Maze, but they’ve managed to make an attraction that can hold four teams simultaneously all day and still feel like you’re playing the real thing. It should have felt like we were being herded like cattle because, behind the scenes, that’s pretty much the truth but, in reality, it felt like a very personal experience throughout. And a good experience too: the zones looked right, the games felt right and the games masters, while not Richard O’Brien, did a damn fine job of capturing his frantic energy. 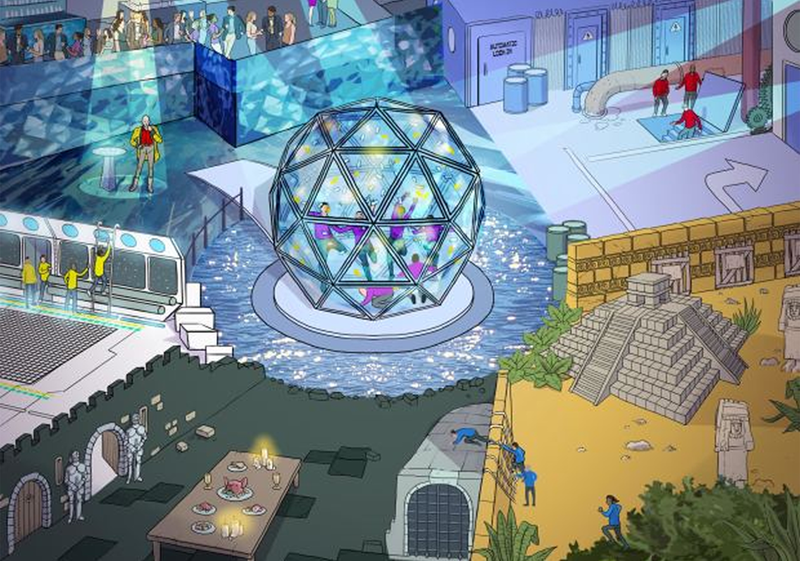 The Crystal Maze is everything I wanted it to be. When I backed the kickstarter project, I had reservations about whether they could deliver. When I was about to book my tickets, I came to the conclusion that it was pretty much doomed to failure. When the first players started visiting, I was pleasantly surprised to hear good reports. When I heard escape room players make complimentary comments, I started to feel a little excited. I tried my hardest not to let that excitement develop, but I failed. Miserably. By the time we arrived, my expectation levels were through the roof. It seemed impossible but they pulled it off. They exceeded my expectations. Trying to recreate a show that has such a special place in people’s hearts seemed like a fool’s errand, but they did it. The Crystal Maze is a special place and, if you ever get the chance to go, grab it with both hands. We ate in Chipotle on Upper Street. It was perfect food for the light jog around the Crystal Maze and made it easy for members of the group who didn’t want to eat beforehand. Plus, we didn’t have to book a table of 16 ahead of time! Agree with everything said here. I was particularly impressed with the smooth transitions between areas and the game masters. I was also able to retrieve my personal items from the lockers and return to the bar afterwards. At least, nobody stopped me. Thanks – someone else told me the same, but I’d forgotten it was so clear in the review. I’ve clarified now. I’m feeling so envious. I hope I’ll get to play it.